Newbery Honor–winner Joan Bauer's newest protagonist always sees the positive side of any situation—and readers will cheer him on! Jeremiah is the world’s biggest baseball fan. He really loves baseball and he knows just about everything there is to know about his favorite sport. So when he’s told he can’t play baseball following an operation on his heart, Jeremiah decides he’ll do the next best thing and become a coach. Hillcrest, where Jeremiah and his father Walt have just moved, is a town known for its championship baseball team. But Jeremiah finds the town caught up in a scandal and about ready to give up on baseball. It’s up to Jeremiah and his can-do spirit to get the town – and the team – back in the game. 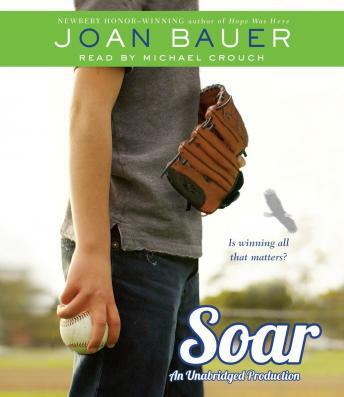 Full of humor, heart, and baseball lore, Soar is Joan Bauer at her best.